I love this time of the year....the time of the year where the weather warms up, days get longer, the sun stays up longer and...pediped® Debuts Spring/Summer 2014 Collection with Over 70 New Styles and Color Combinations!!! I am always excited to see what see new super cute and comfortable styles pediped comes out with each new season and this year is no different! This season's collection highlights Memory Foam Technology™, water-safe Adventure Line and machine washable athletics. The collection highlights over 20 styles designed with a water-friendly material that is machine washable. Two new styles have been added to the water-safe, eco-friendly Adventure Line, Shoreline and Shorebet; and best-selling Sahara is now available for girls. Riddell and Orion, two athletic styles featuring Ultra Light Technology™ debut in both Grip ‘n’ Go™ and Flex®. Memory Foam Technology™ highlights 10 new styles across Grip ‘n’ Go™ and Flex®. • Originals® feature flexible, soft-soles recommended by pediatricians and podiatrists as the shoe’s design closely mimics barefoot walking. • 12 new styles have been added this season. Highlighting the collection is Louisa and Lacee for a brighter wardrobe, and Isabella and Betty cover signature styles. For boys, Martin is an ultra breathable choice for outdoor adventures. • Originals® will retail at $35 and are available for children in sizes newborn to 24 months. 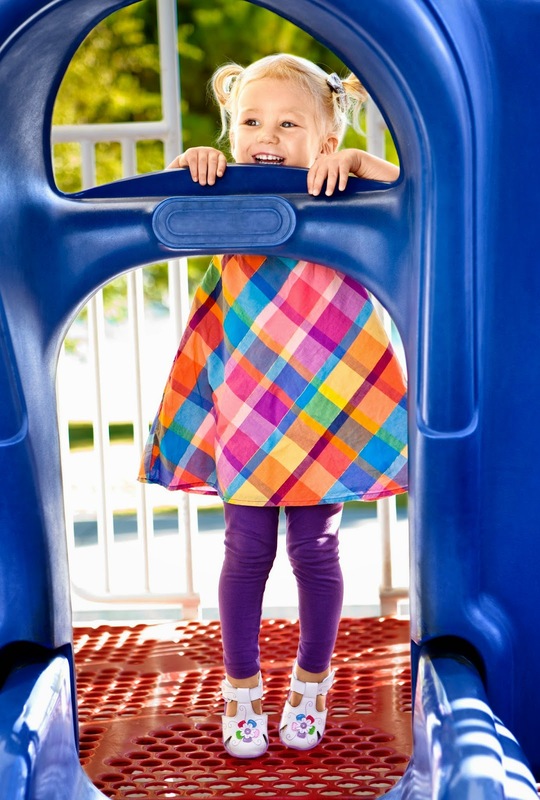 • Grip ‘n’ Go™ is made with all the benefits of Originals®, but a special feature G2 Technology™ is added to help a toddler stay balanced while transitioning into a confident stride. • The collection highlights Memory Foam Technology™ in five new styles: Mirabella, Lacee, Tori, Martin, and Brice. Also new to Grip ‘n’ Go is Riddell and Orion, two athletic styles that are machine washable and water-safe. • Grip ‘n’ Go™ will be priced at $39 or $48 and is available in EU sizes 19-23, US kids 4-7. 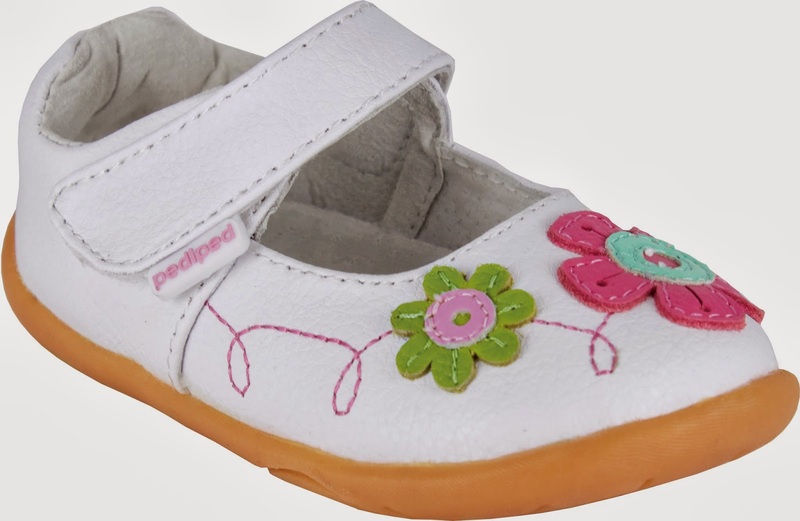 My daughter had the biggest smile on her face when we opened the package from pediped and she saw her new pediped footwear: the Grip n Go Daisy - White Multi. She instantly had to try them on, walk around in them, and then did NOT want to take them off the rest of the day!!! SHE LOVES THEM and I love that they are good for her feet, super comfortable and allow her to run and walk easily! Plus, they are REALLY cute! Sign up for pediped’s newsletter on pediped.com to be the first to know on news of special promotions, new product introductions and more. Plus, LIKE pediped on Facebook at facebook.com/pedipedfootwear or follow pediped on Twitter and Instagram @pedipedfootwear. Also, make sure to check out the new Spring Summer styles at Brian James Footwear, brianjamesfootwear.com, the women’s footwear line from pediped founder Angela Edgeworth. Buy It: You can purchase the pediped® Spring/Summer 2014 Collection for purchase online at www.pediped.com and in select retail stores. Win It: pediped is generously offering (1) Pair of originals (winner can choose gender and size but not style. Comes in sizes 0-6, 6-12, 12-18 and 18-24 mths) to a lucky winner!